There sure has been a long time comin’, but now I’m back. The activity with the film has been low in the past few years. But Bruce Springsteen and E Street Band has been busy. The saxophone player Clarence Clemons passed away on June 18th 2011 after a stroke, but that hasn’t stopped Springsteen and the band from turning out records and playing. The new album Wrecking Ball was released on March 6th 2012 and the band is currently on tour. I went to see them in Berlin on May 30th. And tomorrow I’m heading to Gothenburg for the double shows at Ullevi on July 27th and 28th. It feels starange to see the band without Clarence Clemons, but his nephew Jake is doing a good job on the saxophone. Springsteen has also added a horn section which gives the band a great sound. And Eddie Manion (sax), Curt Ramm (trumpet), Barry Danielian (trumpet), Clark Gayton (trombone) is really great, all of them. The work with the photobook has progressed, the book is currently at the printers and I hope to be able to start selling it as soon as it has been thoroughly checked for typos. 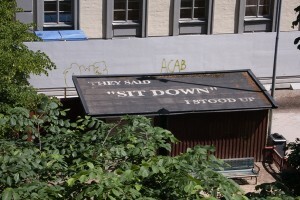 “When they said sit down – I stood up ohoho, Growin’ Up!! Nils Lofgren and Bruce Springsteen at Globen, Stockholm, december 10th 2007. As I did this crazy list with statistics over the shows I’ve seen and the songs I’ve heard, I’ve been brooding over it. Although it’s the first time I’ve made such a list, it is a bit interesting to see the results even if it’s deathly boring making the stuff. Anyway, of the 176 songs I’ve heard, there are 59 that I’ve heard only once. Among the nicer ones of those are 4th of July Asbury Park (Sandy), Be True, Dead Man Walking and Cover Me. Among the “not so good ones” are The Fuse and Big Muddy. Anyway, beeing home from work waiting on a home delivery package, I’ve had the time to think about my list, sort through my pictures and think about this picture book of mine. It’s good to get to grips with the material. Got to do som more gripping and thinking, sorting and writing, so see you soon! After a tour it can get a bit lonely. 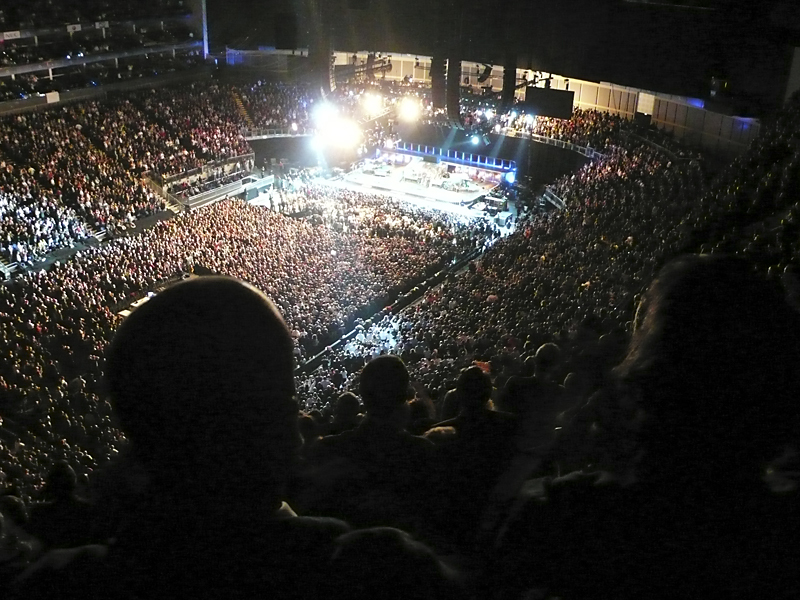 No more travelling, no more shows, no more music and no more talking to Bruce friends. 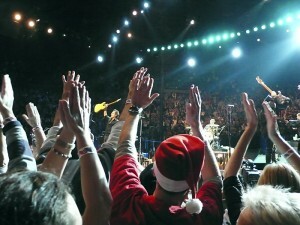 As the tour is still on, Springsteen and the band are back in the states now, there is still setlists to follow. Some fans also go deep down in the vaults to dig out the statistics about the shows they’ve seen, the songs they’ve heard and how many times they’ve heard it. 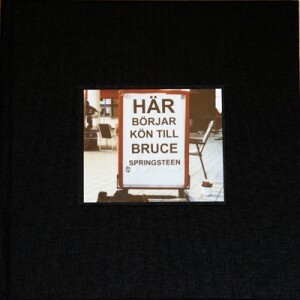 I check in on the swedish fan forum www.springsteen.se regularly, and following a discussion there I decided to make my own statistics. I saw my first show in 1992 when Springsteen brought the Human Touch/Lucky Town tour to Stockholm and the Globe arena. 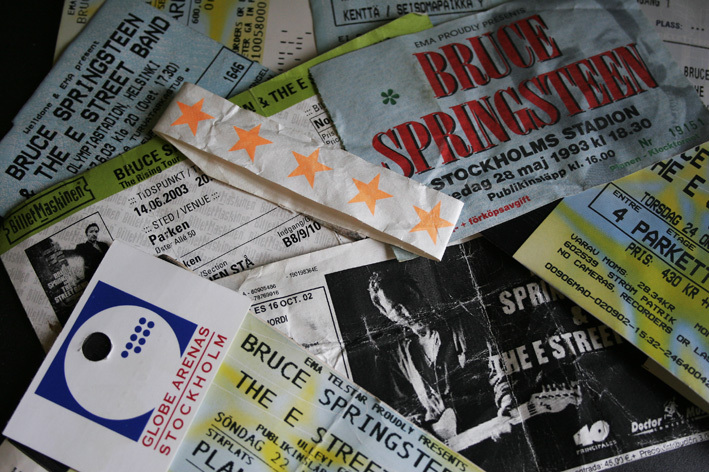 In 1999 was the first year that I saw multiple shows (the two ones at Stockholm Stadium) and 2002 I saw my first show abroad, in Barcelona, Spain. I haven’t really been touring that much, six shows is the most I’ve seen on a tour. That happened 2003 when I saw all the Nordic shows, in Denmark, Finland, Norway and Sweden. This year I also saw six concerts, in Milan, Copenhagen, Göteborg and Barcelona. During these 16 years that I’ve been to Springsteen’s concerts I’ve heard 176 songs, if I’ve not counted wrong. The five most frequent songs I’ve heard are Badlands (20 times), Born to Run (20 times), The Promised Land (20 times), The Rising (19 times) and Bobby Jean (16 times). Check out the Photos page, there are some new pictures there. Mostly I’ve added pictures taken during the ticket release in September 2007. Enjoy! 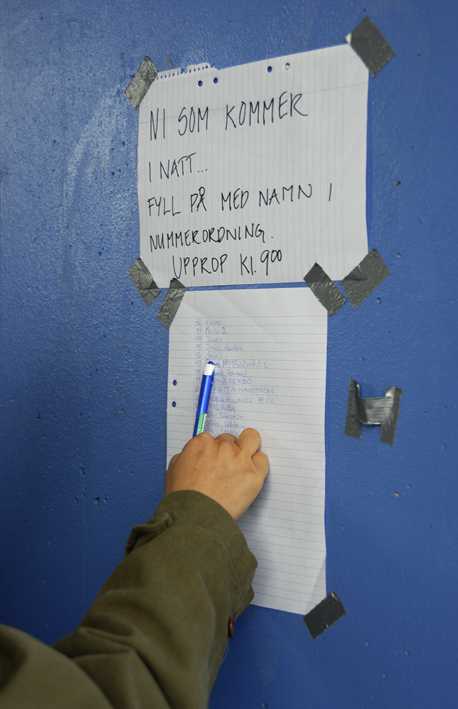 If you arrive at the line and nobody is awake you have to sign the list to get your queue number. Nobody shall be able to jump the queue! 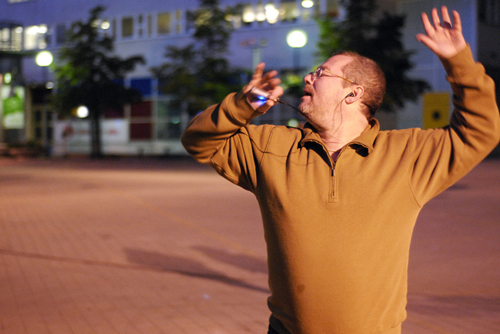 Matte is dancing his heart out to Radio Nowhere in the middle of the night. The web site has enjoyed a much needed face lift. Go check out the Photo-page, to see some pictures taken from the ticket hunt and the Magic Tour in 2007. Keep a look out, because there will be more pictures posted here soon! 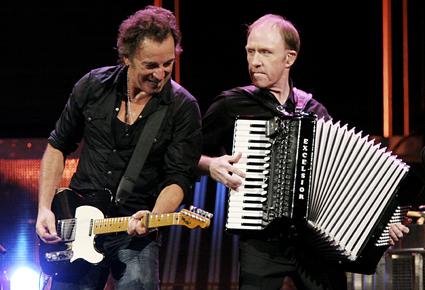 On April 17th came the sad news that Dan Federici, organist and keyboard player in the E Street Band, had passed away. Federici died after a three-year battle with melanoma at a hospital in New York. 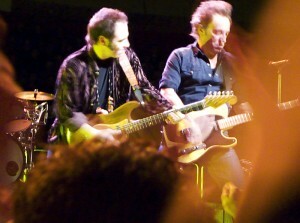 Springsteen and the band postponed three shows to attend to Federicis funeral, but now the band have resumed the tour. 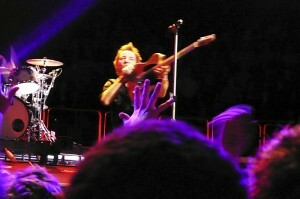 This picture of Springsteen and Federici is taken during the show in Pittsburgh on November 14th, 2007 by photographer Guy Aceto/Backstreets. Read more about Federici at Backstreets and at Bruce Springsteen’s official site. On the different forums fans from all over the world are paying their respect to Federici and his contributions to the E Street sound. And maybe this will be something that is reflected in our documentary, I am not sure yet. We’ll see by the time the tour reach Europe. Two shows are scheduled at Ullevi in Gothenburg on July 4th and July 5th this summer. This poor blog has been left unatended for a while eventhough things has happened on the filming front. This has largely happened because of technical problems with computers, servers, spam protection and a thousand other things. But hopefully we have overcome the troubles. The blog has a new appearance and some new information. 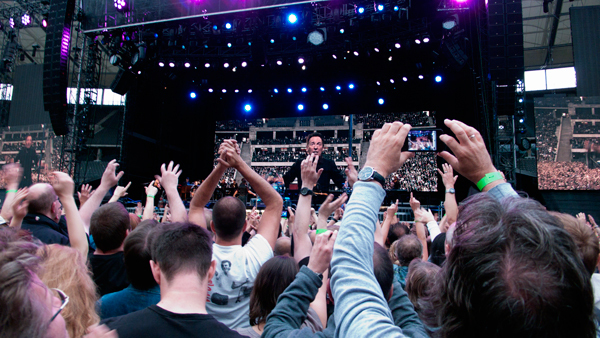 Last December Bruce Springsteen and the E Street Band performed at the Globe Arena in Stockholm. Ingela and I were there, doing our best to film, but we didn’t really find the pictures. It is hard trying to work and at the same time standing in line to get in to the show. I tried to take some stills during the concert, but the pictures didn’t turn out very well. Bruce Springsteen at the Globe Arena, decemer 10th 2007. After the show we did an interview with a swedish fan who had been in in line for days. About an hour or so before the gates were about to open he discovered that he had sent his ticket home with the other stuff that his daughter came to collect. There were a lot of nervous waiting for her return, but her father got his ticket and he enjoyed the show very much. When all this was happening he was very emotional, but when we turned on the camera it was hard to get the same feeling. About a week later I went on a mini tour, I flew to Paris and caught the show and then took the train to London for the tour closer. Unfortunately I also caught the worst cold I had in years, so the experience was rather mixed. It’s not easy to enjoy oneself while you’re coughing and sneezing your lungs and brains out, but I managed to get some pictures in Paris. Yes, Santa came to Paris in the form of The E Street Band. 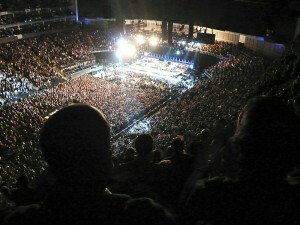 In London I had a seat high up in the O2-arena, wich made it hard to conect to the energy from the band far, far away. The seats in the back at the O2 in London is nothing for people with vertigo.